A Proton rocket and Breeze M upper stage lifted off Friday and successfully deployed a Russian broadcasting satellite and a craft to relay voice, video and data communications between the International Space Station and mission control. After lifting off from the Baikonur Cosmodrome in Kazakhstan at 2104 GMT (5:04 p.m. EDT) Friday, the Proton rocket soared into an overcast sky and released a Breeze M upper stage in space less than 10 minutes later. 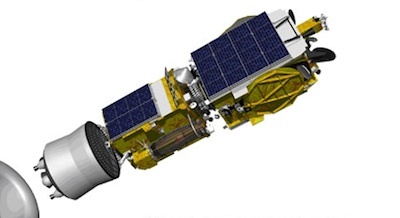 The Breeze M main engine fired four times to raise its orbit before deploying the Yamal 300K and Luch 5B communications satellites more than nine hours after launch. Yamal 300K, which rode in the upper position of the dual-payload stack, separated from the Breeze M stage first. Separation of Luch 5B followed less than 15 minutes later at 0637 GMT (2:37 a.m. EDT). 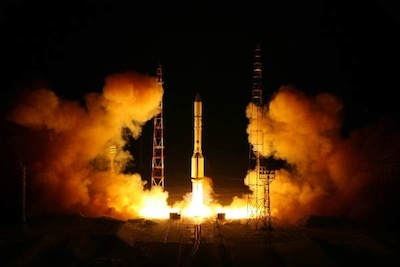 The mission targeted a near-geostationary orbit 22,300 miles over the equator, Khrunichev - the Proton and Breeze M contractor - declared the flight successful. The builder of Yamal 300K and Luch 5B - Reshetnev Information Satellite Systems Co. - said all mechanical structures deployed on both satellites. Yamal 300K will broadcast television and high-speed Internet service across Russia and neighboring regions for Gazprom Space Systems, a Moscow-based subsidiary of Gazprom, the Russian oil and gas producer. The 3,615-pound satellite carries eight C-band and 18 Ku-band transponders to Russia and nearby countries from an operating position at 90 degrees east longitude. Yamal 300K is designed for a 14-year lifetime. Gazprom will launch the Yamal 402 satellite in December on another Proton/Breeze M flight as the company continues a fleet expansion campaign. Luch 5B will relay data, voice and video communications between the ground and the Russian segment of the International Space Station, satellites, and rockets in flight. The new craft is the second in a new generation of Luch data relay satellites. Russia launched the Luch 5A spacecraft in December 2011. The Luch system is Russia's counterpart to NASA's Tracking and Data Relay Satellite System, a network of spacecraft linking mission controllers with the space station, scientific satellites and rockets. Luch 5B weighed 2,513 pounds at launch and will operate for 10 years at 16 degrees west longitude over the Atlantic Ocean. Luch 5A covers the Indian Ocean.